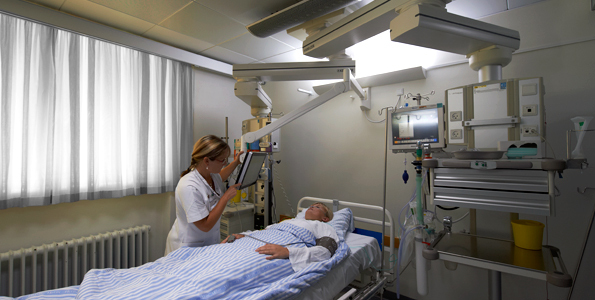 In most hospitals, the light and noise levels are typically constant around the clock. Even at night, when the body needs darkness and rest, the light is on. ”The same lighting around the clock can have negative consequences for staff working in changing shifts. 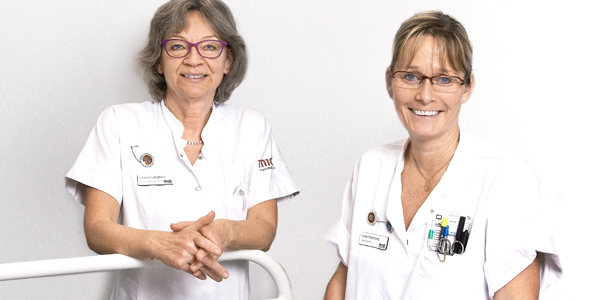 They experience challenges of maintaining a normal circadian rhythm, waking state, cognitive skills and a good mood, and their attention weakens,” explains the clinical nursing specialist and PhD Leanne Langhorn, Aarhus University Hospital. Furthermore, research shows that wrong lighting at night can increase stress levels and reduce well-being and job satisfaction. In order to have a closer look at this, Aarhus University Hospital and Copenhagen University Hospital started working together with the lighting company Chromaviso in 2013 on developing Chroma Zenit Circadian Lighting adapted to the complex hospital environment. Among other things, this includes the challenge of reconciling the various considerations at night, where the body’s circadian rhythm needs darkness, while there is a need for light for the work. The effect of Chroma Zenit Circadian Lighting on staff has been examined in a pilot study with 26 nurses distributed in an intensive care and a rehabilitation department with Chroma Zenit Circadian Lighting, and a control department with ordinary lighting. A criterion for inclusion in the study was that the nurses had at least one weekly night shift. The staff kept a diary and filled in questionnaires regarding sleep pattern, work and well-being. The questionnaire focused particularly on staff working in changing shifts and reflected the complex environment. ”We have received differing statements in the study, and therefore, the results are not clear-cut. However, there is a tendency for nurses who have been exposed to Circadian Lighting to generally experience better sleep, as they fall asleep more easily and their sleep is calmer. They generally find it easier to wake up in the morning and feel more rested after three days in Circadian Lighting, compared to the control group,” explains Leanne Langhorn. Due to the size of the study, it has not been possible to achieve significance of the results. The results support other research showing a connection between lighting, sleep, energy and mood. ”Other new studies show that it usually takes at least four days to get back to normal circadian rhythm after night shifts. Our project indicates that Circadian Lighting might be able to reduce this time. It would certainly be interesting to examine this further,” says Leanne Langhorn. The study also suggests a number of other benefits of Circadian Lighting. For instance, a behaviour-regulating effect due to the dimmed light at night. rest at night. In intensive care, the Circadian Lighting has resulted in the most obvious positive response, which can be explained by previously having the light on and activity around the clock here. In the rehabilitation department, the light is usually off at night,” says Leanne Langhorn. The night lighting is without the blue tones, and therefore, it does not disrupt the body’s circadian rhythm, while the staff still has light for their work. ”Most members of the staff are very positive towards the night lighting. However, there have been a few that feel tired in the evening, because they need the stimulation from the white light. Therefore, they have turned on one of the white light settings in another room as needed,” explains development nurse Lone Mathiesen, Copenhagen University Hospital. ”The right lighting is an important safety factor, including in connection with observation, medication and documentation. Here, the feedback from our project supports other research showing that the lighting can reduce errors,” explains Leanne Langhorn. Chroma Zenit Circadian Lighting is based on a clinically documented light protocol that is adapted to the natural circadian rhythm. Furthermore, each bed has activity-based light settings that the staff can use when the situation requires it. Such as a soothing light or a minimally disrupting, delimited white light for a specific task at night. The solution at Aarhus University Hospital is adapted to the neurointensive care environment, and at Copenhagen University Hospital, it is adapted to the neurological rehabilitation. ”The Circadian Lighting ensures balance between consideration for the circadian rhythm of the body and the staff’s need for good work light. This is a holistic solution that contributes to the staff’s working environment, well-being and health. Further studies with a larger number of nurses and over a longer period of time should be carried out in order to gain more strength and have more perspectives examined,” explains Leanne Langhorn.